Tomorrow – January 16 – Istanbul will be introduced to the world as the 2010 European Capital of Culture. Istanbul, the Capital of European Culture, you say? But Turkey is not even part of the European Union. You’re right…not yet. But, most of Istanbul is in Europe, even if the majority of Turkey lies in Asia. There will be celebrations across the entire city – including fireworks and a DJ show in Sultanahmet to a Tarkan show in Taksim Square – as Istanbul’s year begins. It’s really quite exciting and I know that the Sublime Porte is looking forward to putting its best face forward to Europe and the world. Unfortunately, I won’t get back to Istanbul this year. But I do want to celebrate the city in my own way by displaying a photo or a link from time to time. The photo I’m displaying today was taken inside Istanbul’s Kapal? Çar? ?, Istanbul’s Covered Market also known as the Grand Bazaar. 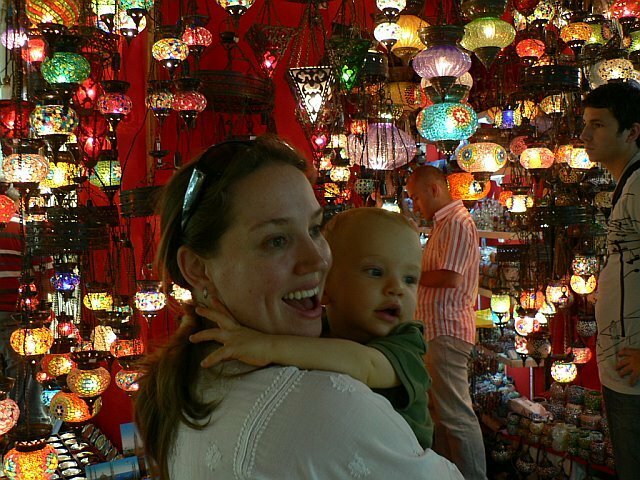 The photo is of me and my son, who was mesmerized by the colorful, beautiful lanterns. This vendor booth is quite well-known within the bazaar – I’ve seen several photos taken with a similar background – but I’m not sure of the booth number. If anyone knows the specific location of this stand within the bazaar, please comment below!